Another brilliant display of power hitting by Josh Cobb gave the Northants Steelbacks a first Vitality Blast win and dented Derbyshire Falcons quarter-final hopes at Derby. 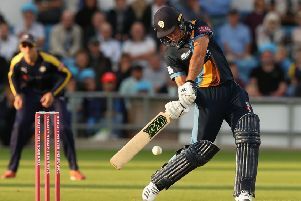 Cobb followed his century against the Birmingham Bears with an explosive unbeaten 73, including seven sixes, off 37 balls as the Steelbacks chased down a target of 178 with 10 balls to spare. Billy Godleman had made a T20 best 77 from 55 balls as the Falcons posted 177 for six but Cobb destroyed their attack to finally give the Steelbacks victory after nine defeats and a tie. There was no sign of what was to come when the Falcons started slowly after winning the toss as the seamers found plenty of movement on a grassy pitch with only 41 coming from the powerplay. Calum MacLeod was caught in the third over at the second attempt at slip off Roy Kleinveldt who then struck Anuj Dal a painful blow on the right hand with a ball that spat. Dal was beaten by a ball from Nathan Buck that came back sharply and although Wahab Riaz pulled a low full toss from Brett Hutton for a big six, he was run out off the next ball by a direct hit from cover. At the halfway stage, the Falcons were 70 for 3 but Godleman drove Seekkoge Prassana for six over long off while Madsen cut and pulled Buck for four consecutive fours in the 13th over. Goldeman completed his 50 from 43 balls and then launched the next one from Prasanna over long on but Madsen drove a slower ball from Sanderson to cover to break a stand of 83 from 49 balls in the 16th over. Godleman was run out going for a second but Gary Wilson provided late acceleration by pulling Kleinveldt for six in an unbeaten 24 before Buck restricted the Falcons to three off a clever last over. The Steelbacks started well with Ricardo Vasconcelos ramping Lockie Ferguson for six while Duckett drove and pulled powerfully as the Steelbacks took 62 from the powerplay. Duckett was threatening to take control when he missed a reverse sweep at Alex Hughes and Ferguson delivered a searing yorker to knock over Vasconcelos in the ninth over.Cobb showed he was in the groove with a top edged six and a straight-driven four off Hardus Viljoen before taking another six off Hughes. Ben Curran, brother of Surrey’s Tom and Sam, made only two on his senior debut but Cobb pulled Hughes for six before twice driving Viljoen over the ropes as he surged to a 27 ball 50. The Steelbacks needed only 20 off the last three overs but with skipper Alex Wakely lending sound support, Cobb finished it in style with consecutive sixes off Ravi Rampaul.